Before I write anything I’d like to mention that a friend said to me that I usually put forward a more considered, impartial opinion in response to a Facebook status update I made about the website. He is dead right, I usually do but in this case, as a daily user of the JSE I felt horribly let down by the redesign and there were too many factors that prompted my disappointment. Furthermore, I run a digital marketing agency that designs and builds websites, and I would feel awful if we launched something and go attacked for it. So, I’m expressing my opinion below on the new website and am more than happy to debate the various elements. It’s just my opinion and I’m by no means privy to all the details (timeline, budget, etc) of the project. Both the agency that made the site and the JSE themselves have said it’s just a phase 1. 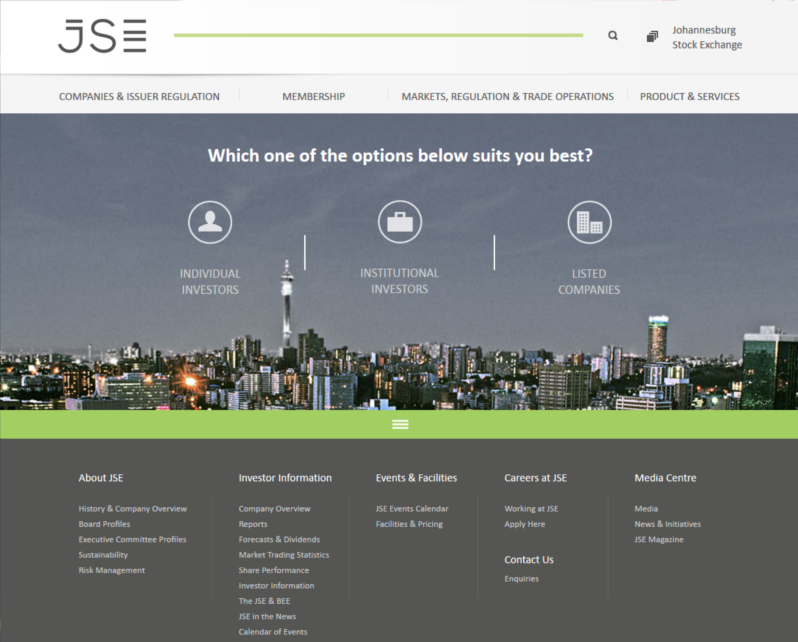 This afternoon I was catching up on my trading news when I came across an article that mentioned that the JSE had launched a new website. I cannot tell you how excited I was, I typed www. dot jse dot co dot za into my browser in a split second and then waited anxiously for about 45 seconds for the website to load – the suspense was killing me – and then it loaded.. huh? Is that really what the new website looks like I asked myself. A grave let down, like waiting for your meal at a restaurant only to receive the wrong one. 10. #Mobility14: Of about 13m adults using the Internet in SA, 5,8m use only on phone, 6,4m use on phone and PC/laptop/tablet. The JSE website doesn’t take mobile devices into account at all – load it up on your phone and you’ll see what I mean.. happy scrolling! I’m not a designer nor do I try to put myself across as someone who understands the sheer intelligence that goes behind great designs, but in my longer-than-a-decade in web design career I’ve certainly learnt some important things from the professionals and masters that have worked with me along the way. The website honestly looks like a template design that has been retro-fitted in an attempt to fulfil an unclear brief? There are some strange elements like the green horizontal bar at the top that is actually the search, the strange green bar that hides the bottom navigation and the ugly photograph of the city which appears to be stuck in there to give the site some life. Venturing deeper into the website presents me with what looks like an attempt to create a dashboard type approach with the aim of displaying a lot of information in a tailored manner. It doesn’t work for me, I know a dozen designers who could have communicated that information in a more consumable way. It’s heavily overwhelming and really difficult to know where you are or where to go. As I mentioned, I trade daily on the JSE and I was very confused as to what was what, let alone someone who is just trying to get into trading. Please share your thoughts on this, I’m not the pro, correct me if I’m wrong. I want to hear people talk about margins, gutters, spacing and the likes because I don’t believe this was executed well. The old website was very old, intimidating and confusing, sure, but I’m trying to figure out if this one is that much better? “How to invest” was really easy to see, the “LEARN”, “DEMO” and so forth links were nice and clear. I feel that the old site got people around far better. Can you find the login? What on earth is that? I wonder if they handled the redirects from the old website to the new website so that the build authority has been carried over..
Too many things to mention here and although SEO might not have been part of the brief, I’d expect a very basic foundation to be implemented at the very least. 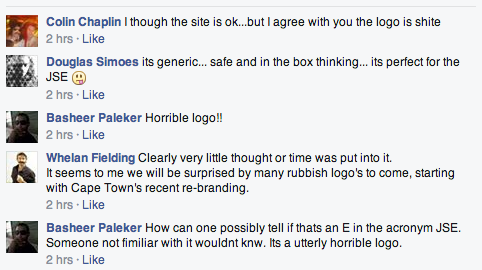 @ChristopherM Took people time to like the new City of CT logo. Sleep on it. Maybe tomorrow you will like it. 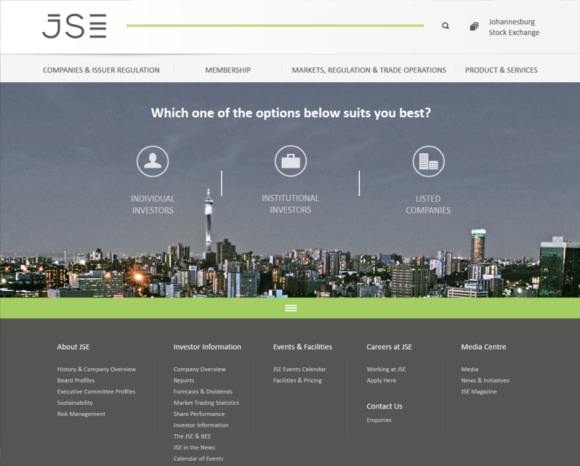 @JSE_Group I cannot find the user login field on the new website.The login field on the old website was visible and easy to navigate to . Native is a big digital agency, one which we’d expect exceptional output from. Now, I don’t know the brief, nor the budget or the timelines, but what I do know is that that budget won’t have been small. I don’t believe that the large agencies would take on clients of this sheer size for small amounts and my guess (also knowing it’s on Sharepoint) is that it would have cost well up in the hundreds of thousands. Based on that I would have expected something better. Just my opinion again and I’m open to all opinions, but that’s how I feel. Native did say that they “developed” the site, so perhaps they were excluded from the design. I have seen a fair number of people commenting on the site saying they like it and it’s less intimidating. Both Native and the JSE have commented saying this is Phase 1 and Phase 2 will be rolled out once they’ve collected public feedback. There are always two sides to every story and none of us know all the facts, so I am happy to be put in my place if I’ve chirped on about this without all the facts.